Episode 38 of the World Wrestling Resource Podcast features a pair of U.S. National Team coaches as Matt Lindland and Terry Steiner return to the show. Coach Steiner was finishing up a practice in Colorado Springs as he readies Sarah Hildebrandt and Alli Ragan for the non-Olympic World Championships in Budapest on Dec. 10-11, while Lindland was already in Budapest, sticking around with his athletes after the Golden Grand Prix and getting them ready for the Greco Clubs Cup prior to the Worlds. ... See More Both coaches will go back through points from Rio at the 2016 Olympics, talk about development of their respective styles including the college impact of having women's wrestling working towards NCAA emerging sports status as well as Lindland's take on Williams Baptist's announcement of a new Greco-Roman college program. We'll also talk with both coaches about their scheduling change, moving their nationals to December and setting their World Team in April, breaking away from the same format the men's freestyle teams have been using. The World Wrestling Resource has a slew of resources for wrestlers and coaches from all levels and information about the products can be found at www.worldwrestlingresource.com. Do you have a question or a topic you'd like to hear the World Wrestling Resource staff discuss? Drop us a comment on Facebook at www.facebook.com/worldwrestlingresource or on twitter at @WWRESO. The World Wrestling Resource is sponsored by DefenseSoap. 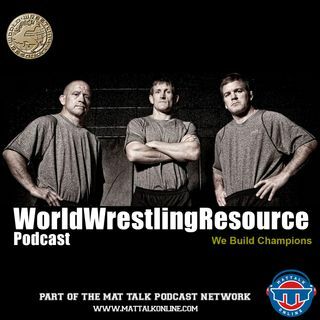 The World Wrestling Resource Podcast is a presentation of the Mat Talk Podcast Network. SUBSCRIBE TO THE WWR PODCAST iTunes | Stitcher | Spreaker | iHeartRadio | SoundCloud | TuneIn | Google Play Music | RSS JOIN THE TEAM And if you're a fan of the extensive and broad-based reach of the shows on the Mat Talk Podcast Network, become a TEAM MEMBER today. There are various levels of perks for the different levels of team membership. If you like wrestling content -- scratch that -- if you LOVE great wrestling content, consider becoming a team member. You'll get some cool stuff too. Looking to start a podcast of your own? Get a free month with Libsyn by using the promo code MTO when you sign up. You'll get the remainder of the month from when you sign up as well as the next month free. It'll be enough time to kick the tires and lights some fires.